This category features Bandanna-Size 22"x22" square silk scarves - great around the neck as a chic small scarf. They can also tied to a purse as an elegant accessory; or worn as a fashionable bandanna on the head. 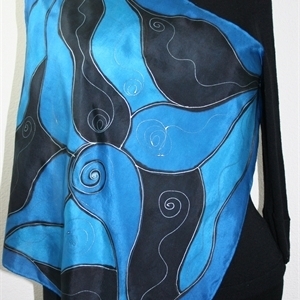 All scarves featured in this category can be created as larger square scarves - as Custom Orders. 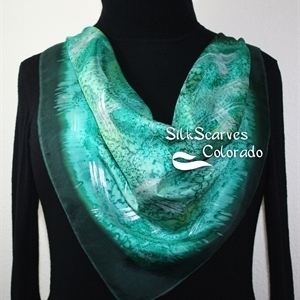 Please send an email with your ideas to sales@silkscarvescolorado.com and we can discuss the new design. Yellow, Black Hand Painted Silk Bandanna Scarf GOLDEN SERENITY-2. Size 22x22 square. Silk Scarves Colorado. Elegant Silk Gift. 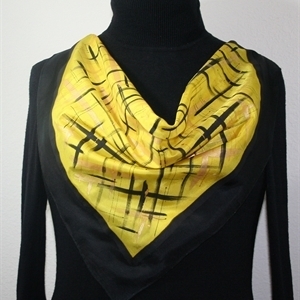 This is a 100% habotai silk scarf in yellow, with border in black. Decorated all over with metallic brushstrokes in black and gold. SIZE: This is a Bandanna size square scarf - 22" x 22" square (56 cm x 56 cm). This is original size - slight shrinkage occurs due to the steam-setting process. This beautiful square silk scarf can be worn as a chic head bandanna, or around the neck as an elegant small scarf, or tied to a purse as a fashionable accessory. 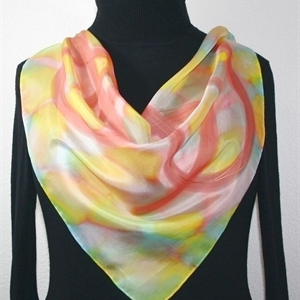 Yellow, Coral, Pink Hand Painted Silk Bandanna Scarf PASTEL EMBRACE. Size 22x22 square. Silk Scarves Colorado. Elegant Silk Gift. Red, Yellow, Blue, Green Hand Painted Silk Bandanna Scarf SUMMER FLAMES. Size 22x22 square. Silk Scarves Colorado. Elegant Silk Gift. 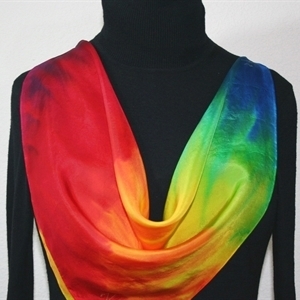 This is a 100% habotai silk scarf, featuring brushstrokes in rainbow colors - purple, berry red, bright red, orange, yellow, lime, green, turquoise and blue. SIZE: This is a Bandanna size square scarf - 22" x 22" square (56 cm x 56 cm). This is original size - slight shrinkage occurs due to the steam-setting process. This beautiful square silk scarf can be worn as a chic head bandanna, or around the neck as an elegant small scarf, or tied to a purse as a fashionable accessory. Black, Pink, Orange Hand Painted Silk Bandanna Scarf BRAZILIAN DANCE. Size 22x22 square. Silk Scarves Colorado. Elegant Silk Gift. 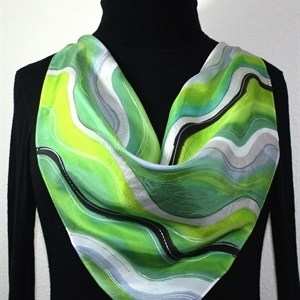 Green, Lime, Grey Hand Painted Silk Bandanna Scarf GREEN WAVES. Size 22x22 square. Silk Scarves Colorado. Elegant Silk Gift. 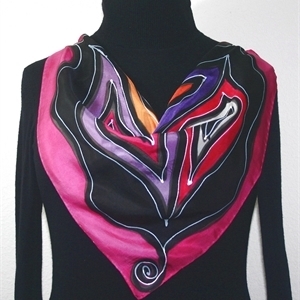 Red, Cranberry, Purple Hand Painted Silk Bandanna Scarf MIAMI HEAT. Size 22x22 square. Silk Scarves Colorado. Elegant Silk Gift. 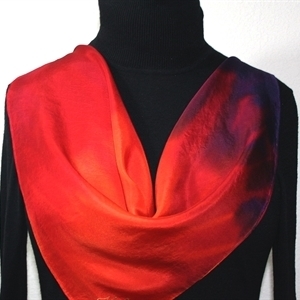 This is a 100% habotai silk scarf featuring diagonal brushstrokes in grading shades from bright red, through merlot red, cranberry, to purple. SIZE: This is a Bandanna size square scarf - 22" x 22" square (56 cm x 56 cm). This is original size - slight shrinkage occurs due to the steam-setting process. This beautiful square silk scarf can be worn as a chic head bandanna, or around the neck as an elegant small scarf, or tied to a purse as a fashionable accessory. Green, Sage Green, Teal, Olive Hand Painted Silk Bandanna Scarf GREEN FIELDS. Size 22x22 square. Silk Scarves Colorado. Elegant Silk Gift. Pink, Purple, Orange Hand Painted Silk Bandanna Scarf TAHITIAN DANCE. Size 22x22 square. Silk Scarves Colorado. Elegant Silk Gift.